RCA VICTOR, I WAS THE ONE, ELVIS PRESLEY, HEARTBREAK HOTEL. 2.78 RPM, HAIRY JOE JUMP, HARLAN LEONARD AND HIS ROCKETS, MY GAL SAL. 3.78 RPM, I'VE GOT A NEW LOVE, GRIFFIN BROTHERS, THE TEASER. 4.78 rpm CAN'T AFFORD TO LOSE MY HAIR, MEMPHIS MINNIE, ME AND MY CHAUFFEUR BLUES. 5.78 RPM ORIOLE, CRAZY WORDS--CRAZY TUNE, DIXIE JAZZ BAND, COFFEE POT BLUES. 6.78 RPM BLUEBIRD, 78 RPM, TEN PRETTY GIRLS, RONNIE MUNRO , THE HAPPY, BOOTS AND HIS BUDDIES. 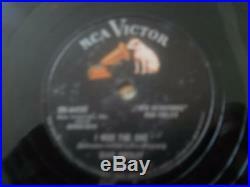 VICTOR 78 RPM, GIRL OF MY DREAMS, I LOVE YOU, BLUE STEELE AND HIS ORCHESTRA, SUGAR BABE , I'M LEAVIN. BROADWAY RECORDS, 78 RPM, MARIE, BILL HAID'S CUBS, THAT OLD SWEETHEART OF MINE. COLUMBIA, 78 RPM, I STILL LOVE YOU , THE RADIOLITES, MY OHIO HOME, CASS HAGAN AND HIS PARK CENTRAL HOTEL ORCHESTRA. Victor 78 rpm , sippi, louisiana sugar babes, willow tree. 11.78 RPM KEEN, YOU SEND ME, SAM COOKE, SUMMERTIME. BLUEBIRD 78 RPM, 2 RECORDS BY THE SAME SINGER, GIANNINA MIA, VERNON GEYER, THE SWEETHEART OF SIGMA CHI, STAR DUST, A FOX TROT SERENADE. GREY GULL RECORD LABEL, 78 RPM. THE WRECK OF THE TITANIC (IF YOU ARE A TITANIC COLLECTOR, YOU MIGHT WANT THIS RECORD). THE FLIP SIDE OF THE RECORD IS WRECK OF THE OLD'97 AND SUNG BY JEFF CALHOUN. 14, 78 rpm, honey, broadway broadcasters, let's get together , the home towners. Jewel 78 rpm, miss you , vocal larry holton, miami society orchestra, queen of the caravan, vocal chorus, wm. Stanley, roy collins dance orchestra. Vocalion, red record, prince of wails, 78 rpm, the tennessee tooters, i ain't got nobody to love. CHESS RECORDS, PRECIOUS MEMORIES, THE ELLIS & DIXON SPIRITUAL & VOCAL GROUP. VICTOR, 78 RPM, DEAR OLD SUNNY SOUTH BY THE SEA, JIMMIE RODGERS, MY LITTLE OLD HOME DOWN IN NEW ORLEANS. 78 rpm conqueror, unwanted children, frank luther, seven years with the wrong man. Decca, trying, grady martin, sweet jennie lee. 21.78 rpm, Rhumboogie, sail on boogie, t bone walker, i'm still in love with you. Bluebird, 78 rpm, i've got troubles in mind, jimmie revard, you're mean to me. Brunswick 78 rpm, 4 records, jimmie noone apex club orchestra, 1. Apex blues, sweet lorraine, 2. I know that you know, sweet sue -just you, 3. Four or five times, every evening, 4. Victor, 4 records, dixieland jazz group, 1. Beale street blues, joe turner blues, 3. Aunt hagar's blues, east st. John henry blues, careless love blues. Decca, 78 rpm, bluer than blue, lil armstong, born to swing. Decca, 78 rpm i'm the one who loves you, reggae childs, sweet stranger. Decca, 78 rpm, you're out of this world to me, mal hallett, true confession. Brunswick, 78 rpm , 3 records, 1. The sheik of araby, shim me sha wabble, 2. Tea for two, i want to be happy. Capitol, 78 rpm, rock island line, leadbelly, eagle rock rag. Decca, 78 rpm 2 records, chan boy, jimmy mcpartland, jazz me blues, and sugar jimmy mcpartland, the world is waiting for the sunrise. Capitol, 78 rpm, i got a break, mean old world , t bone walker. Vocalion, swingin and truckin' , crystal springs ramblers, down in arkansas. Columbia, 78 rpm, i'm left with the blues in my heart, kiing carter and his royal orchestra, minnie the moocher. Bluebird, 78 rpm, gonna follow my baby-blues, arthur big boy crudup, mean old'frisco blues. DISC JOCKEY RECORDS, 2 AMERICAN GAL POLKA JIMMY NEJEDIO, FIREMANS MARCH AND BORN SWALLOW POLKA , JIMMY NEJEDIO, A NIGHT IN MAY WALTZ. DECCA, JESSIE, CLIFF BRUNER, SAN ANTONIO ROSE. 37.2 OF THESE, IMPERAL CORRIDO, MANUAL S. DIVA, NEOPOLITAN NIGHTS, ERNIE GOLDEN, SONNY BOY. CAPITOL , REMEMBER ME, MOLLY BEE, PINETREE, PINE OVER ME. KEYNOTE RECORDS, SEPTEMBER IN THE RAIN, WILLIE SMITH, QUINTET. PARAGON, COLD IN DE WINTER, LLOYD THOMAS, GERMAN CALYPSO. COSMO, RUMORS ARE FLYING, THE TWO TONES, I LEFT MY HEART IN MISSISSIPPI. PERFECT, SUSIE'S FELLER, CLIFF EDWARDS, I CAN'T GET OVER A GIRL LIKE YOU. Vocalion, 78 rpm somebody and me, fox trot, the Bostonians with vocal trio , there's a rickin pickin' a chick-chick-chicken, six hayseeds with vocal chorusokeh. Okeh , 78 rpm, marguerite the melody sheiks , cecilia. MERCURY, COTTON -EYED JOE, GEORGIA SLIM, YOU NEVER SHOUL A DONE IT. Coral, i'm so lonesome, tommy sosebee, you can't erase my memory. Victor, second hand rose, fanny brice, my man. BENIDA, MELANCHOLY BABY, WILLIE GIBSON, I CRIED FOR YOUbrunswick. Brunswick, rpm , pinetop's boogie woogie, pine top smith, pinetop's blues. Brunswick, 78 rpm, jump steady blues, pine top smith, i'm sober now. Columbia 78 , over the waves, smile-lee, stumbling there are 4 of the same records. Okeh 78 rpm, frieze breeches tom ennis kildare fancy. Victor, on the honeymoon express, collins and harlan, the international rag. Okeh, after all, campbell and burr, kisses. 60, victor, jazz baby, marion harris, bring back those wonderul days , arthur fields. Wishes, benj jerome, , collins and harlan , when you first kiss the last girl you love, joe howard. Columbia, new king porter stomp, fletcher henderson, can you take it? Emerson, virginia blues, by louisiana five, lead me to it. Continental, hurray johnny hurray, red miller trio, the man who comes around. 65, victor, i'm afraid to come home in the dark, clarice vance, one sided record. IF YOU WANT TO KNOW THE CONDITION OF THE RECORD, LET ME KNOW AND I WILL TELL YOU WHAT I SEE ON THE SURFACE OF THE RECORD AND THE LABEL, IF ANYTHING. I DO NOT TELL PEOPLE THIS IS A # THIS OR THAT AND I DO NOT TELL PEOPLE THAT THIS RECORD IS THIS LETTER OR THAT LETTER BECAUSE THAT WOULD JUST BE AN OPINION OF MY OWN AND NOT A FACT, BECAUSE EVERYONE HAS THEIR OWN OPINIONS. And its a never ending arguement. WITH JUST ONE RECORD OR MORE. THEN YOU WOULD HAVE TO TAKE THE RECORD AND THE CONTAINER /OR THE BOX IT CAME IN AND ALL THE PACKING TO YOUR POST OFFICE TO MAKE A CLAIM. IF THE POST OFFICE NEEDS ANY PAPERWORK OTHER THAN WHAT YOU WOULD HAVE (THE PROOF THAT WHAT YOU PAID FOR THE RECORD) I WILL SEND YOU WHAT THE POST OFFICE HAS GIVEN ME. THE WEB SITE IS A FREE WEB SITE. TAKE THEM ALL, or TAKE WHAT YOU WANT, JUST MAKE AN OFFER. The item "78 RPM, ELVIS PRESLEY, HARLAN LEATHER, MEMPHIS MINNIE, BILL HAID'S CUBS, ETC" is in sale since Thursday, July 13, 2017. This item is in the category "Music\Records". The seller is "lousyphotos" and is located in Orland Park, Illinois.